Today only save up to 30% on Bulletproof Coffee products! 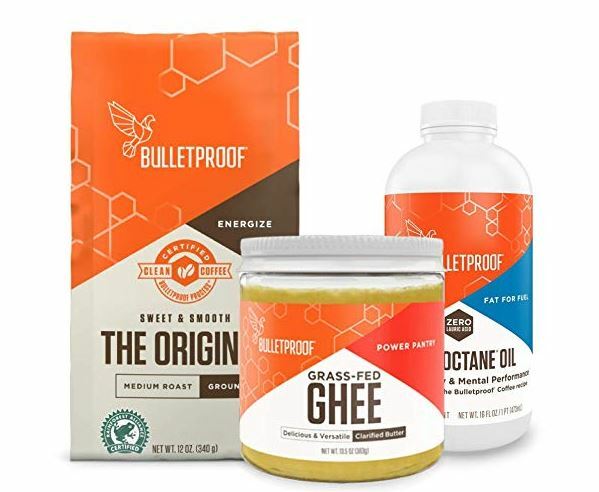 For example this Bulletproof Starter Kit, which includes: 12oz Ground Original Roast Clean Coffee, 16oz Ketogenic Brain Octane Oil, and 13.5oz Grass-Fed Ghee, Perfect For Keto Diet is on sale for $39.95 Shipped. -CERTIFIED CLEAN COFFEE: Bulletproof Upgraded Coffee Beans are meticulously grown at high altitude on single estates in Guatemala, hand-harvested, carefully processed, handled and roasted to maintain maximum integrity and flavor. The final roast then undergoes proprietary lab testing to verify that our coffee meets the Bulletproof quality and purity standards. -HIGH QUALITY C8 MCT OIL: Brain Octane is carefully extracted from 100% pure coconut oil, not palm oil, to protect wild orangutan habitat in Southeast Asia. Not just coconut or MCT oil – Brain Octane is made with only the best parts of the coconut, which metabolize more efficiently into ketone energy than more common oils. -100% GRASS-FED, CLARIFIED BUTTERFAT: Bulletproof Ghee is thoughtfully produced in the traditional Ayurvedic method by slowly heating grass-fed butter over an open flame, carefully removing the moisture and milk solids resulting in pure, clarified butterfat that preserves only the best parts of butter. This process removes nearly all casein and lactose. -KEEPS CRAVINGS AT BAY: Brain Octane oil is distilled from the most potent part of the coconut, resulting in a highly ketogenic oil that metabolizes more efficiently and helps keep your cravings under control. -SUGAR-FREE ENERGY: As soon as you consume Brain Octane, it is rapidly absorbed and changed into ketone bodies – providing instant energy to the brain without breaking down glucose from sugars or carbohydrates. Experience the power of using quality fats for fuel, keeping you full and focused for hours. View both options in the sale HERE.